Spittin' image of her daddy! Day 1 - 316 Day Gestation - 16 lbs. Day 1 with dam, Roxie. Taupie's biopsy (September, 2016) results are in! Density: 53.6 mm; Secondary: Primary fiber ratio: 9.7:1; In-skin mean primary fiber diameter: 25.3 microns / SD 4 microns; In-skin mean secondary fiber diameter: 21.1 microns SD 3.8. Bioposy sample was extracted by Ian Watt personally. He has a super long staple length (in the top 6% EPD 2016), with high frequency, medium amplitude crimp. UPDATE: Stella is close to being ready for her maiden breeding. 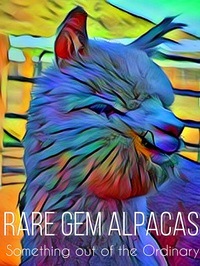 She comes with a breeding to any Rare Gem herdsire. Buyer's choice... but we suggest FTAF's Privateer. He is throwing champion offspring with his amazing fiber qualities. AND... 4 out of 5 times, he has thrown the color of the dam! Unique? Absolutely! She has well-defined black and white spotted legs and ears and a spotless platinum grey blanket. Stella has the cutest white blaze in the center of her face and a perfectly shaped head. Fleece? 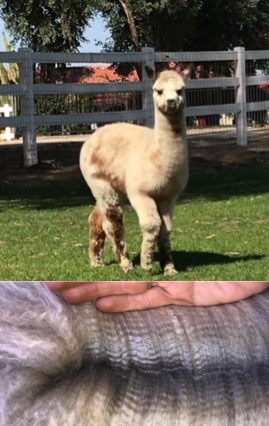 Well, not only is the coloration stunning, her fleece as a newborn at only 316 days gestation is at least 2 inches long and already full of crimp and character! 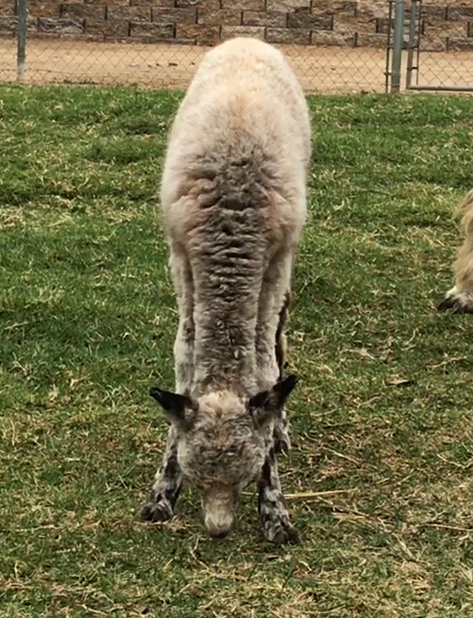 As I watch her fleece develop, the color has evened out and is a brilliant platinum grey with a lavender tint. And this girl has one spunky personality and thinks she is a mom already. 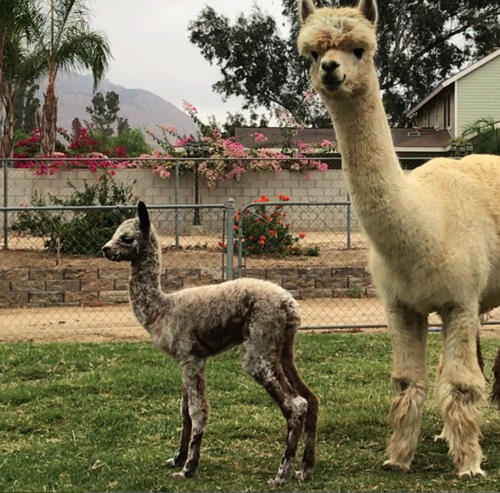 She has taken on the youngest cria of the group, Silky Sam, I Am and watches over him and bosses him around like he is her own!! Yep, she is going to be one great mom! 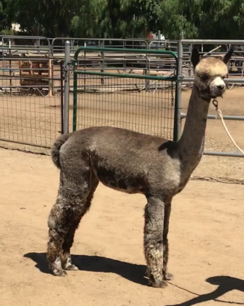 Stella's dam, Roxie, is a full Peruvian 3/8 Accoyo gal sired by Legacy son PHA Peruvian Taos. Roxie is the only female produced by the pairing of Taos and Isabella. She is also the full sister to multi color champion BMF Tao's Zeppelin and the multi blue ribbon winner BMF Tao's Pearl Jam! Just like her champion brothers, Roxie brings a well-balanced frame and clean top line. She is true to type with strong substance of bone. 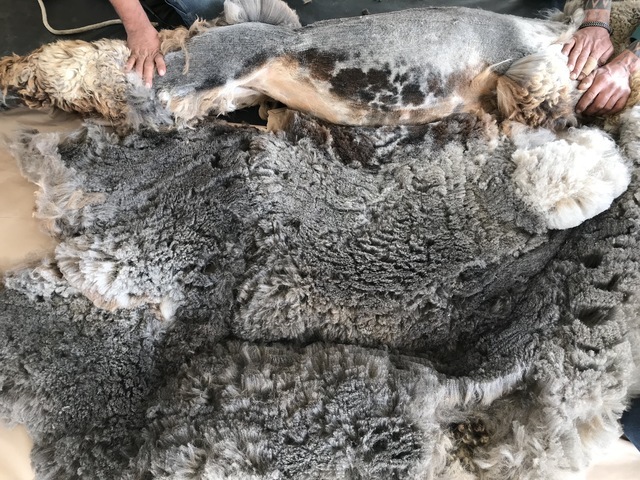 Her fleece is fine and silky smooth just like her brothers! Her current photos show the volumes of fleece she will produce as well as excellent staple length. Roxie's EPDs are within the top 5% in four (4) categories (2016)!! And Daddy... Vintage Cashmere's U-Taupe-ia "Taupie" is a handsome appaloosa harlequin herdsire that gets the job done. He is highly-expressive for this unique gene(s) and continues to throw beautiful, elite-fleeced appaloosa and harlequins-- including the elusive platinum harlequins and modern smoky blue greys.